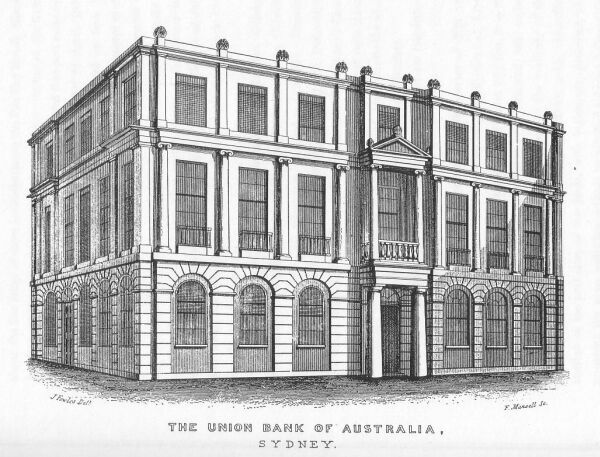 The first bank robbery in Australia was carried out by a Londoner with the unusual name of Sudden Solomon. He had been born George Blackston but often used the alternate spelling, Blaxton or the name William Blackstone. He was a criminal whose speciality was breaking into safes. One day in the early autumn of 1828 he realized that a drain cover in Lower George Street in Sydney led to a tunnel that went right under the foundations of the Bank of Australia. An idea immediately popped into his head and he recruited four others to help him with the plan. For nearly three weeks they dug a side tunnel until they estimated they were below the strong room. One of them, rejoicing in the name Skinny Charlie Farrell, managed to squeeze through a hole in the floor and passed through it £750 in English silver money, 2,000 Sovereigns, £14,500 in banknotes and 2,030 Spanish dollars, which were then legal tender in Australia. Within a year Sudden Solomon, now broke, was caught trying to rob a gambling den. He was sentenced to death but the sentence was commuted to 14 years on Norfolk Island —”a place of the extremest punishment short of death”. After serving 18 months, Solomon was a broken man and offered to reveal all the details of the robbery for a pardon and free passage to England. He gave them Skinny Charlie Farrell’s name, named Dingle as another robber and a fence called Woodward. The gang was quickly apprehended but, while waiting for a ship to take him back to England, Solomon ran out of money. To remedy his financial shortfall he decided to rob a small shop. He was caught and ended up back in prison with his own gang members. He was found dead in a swamp in 1844.